Robots are entering the workforce. Some will work alongside you. Others, sadly, will put you out of work. The question is, which jobs are actually on the chopping block? The answer to that has been bathed in media hype, but we talked to experts who gave us some realistic answers about which human careers might be endangered—and why. Robots are already working in distribution centers. This kind of setting is fertile ground for robot takeover, because bots are good at repetitive tasks that don’t require them to adapt to new situations on the fly. Adjusting to dynamic environments, improvising reactions, and nuancing your behavior based on the changing situation are still very human things to do. Robot developers have a hard time perfecting those behaviors in robots, which is why we don’t see a Rosie the tidying, talking, wisecracking housemaid bot yet. But in factories, robots can be programmed to do one thing, in one place, over and over again. It’s called “narrow AI.” A robot can be stationed in one spot on the distribution warehouse floor, lifting palettes that are all the same shape and size, and placing them on a conveyor belt whose location never changes. In fact, this is already happening in shipping centers like United Parcel Service in the US, where 7,000 packages are sorted every minute. Add professional car drivers to the vulnerable list. We’re already in the midst of this transition. “I think cars, especially cars for hire, will probably be autonomous,” says Richard Alan Peters, an associate professor of electrical engineering at Vanderbilt University and CTO at Universal Robotics. Obviously, companies like Google have some crash-related kinks to iron out of their self-driving experiments. Plus a nightmarish morass of legislation awaits this industry of automatic magic cars that cruise busy streets without a human at the helm. But it’s happening: Look at Carnegie Mellon University, where Uber has a whole lab set up solely for self-driving cars. “Especially [security guards] that are out observing the perimeter after hours. Checking doors and halls will be automated,” Peters says. Basically, any job that’s super repetitive could be a target for robot replacement. To compound that, any repetitive job that the robot can do better than a human is especially vulnerable. Robo security guards already kind of exist. Microsoft announced last year that they’ve toyed with Dalek-shaped sentries roaming their Silicon Valley campus. These five-foot tall, lidar-equipped bots scan intruders, recognize license plates, and comb social media activity for any hints of danger in the area. 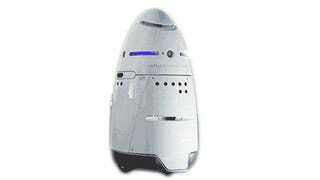 The makers of these robots say the intention is not to replace human security guards. We’ll see about that, though, as the tech continues to advance. Here, we’re talking about facility cleaning that doesn’t require fine motor skills. So folks who might come to your office and power blast your cafeteria floor, for example, could be replaced by robots. Polishing, vacuuming, scrubbing… that’s what robots will be doing (and already are doing in many homes with Roombas). However, not all custodians need worry (yet). “The history of robotics shows that most tasks—e.g., tidying a room—are much harder for robots than one might think,” says Seth Lloyd, a mechanical engineering professor at MIT. Tasks like cleaning an apparatus that’s a bit more complex—say a toilet or sink—will still require humans who have articulated manipulators and nimble fingers covered with sensor-packed skin. “A lot of research is going into cooperative assembly by robots,” Peters explains. He says that assembly of huge objects like ships and planes will be largely automated soon. Again, the main reason is a lot of manual labor is involved: pick up that piece of drywall, hold something in place, screw something in. In a somewhat inverse relationship, though, while robots will make construction crews smaller, we’ll still need humans there to repair the robots when they break down or need fixes. So, logic gap, right? Are robots really stealing jobs if we still need humans to repair them? Well, the question is what kind of jobs. The robots are doing jobs that are tiring, even dangerous, to humans. But robot repair is the kind of job that goes to people who have specialized engineering knowledge, often obtained through an expensive higher education. Which means construction workers could be replaced by robots and middle class human engineers. This is one of the many reasons why economists worry that a robotic workforce could lead to greater income inequality and unemployment for people currently in blue collar jobs. Certain types of mechanized agriculture fall into the domain of our mechanical coworkers. Drones, in particular, are being deployed to fly up and down rows of crops to do a variety of errands. They can spray insecticides and distribute fertilizer, monitor plant growth, plant seeds, and watch for pests. It’s likely that farmers with drones will put a bunch of farmhands out of work: Drone companies like senseFly and Agribotix are already marketing agricultural uses for their machines. Plus, the US and UK governments both support development of agricultural robots—support in the form of cold hard cash. These are just some of the jobs that might face extinction in the coming decades. There are many other human careers speculated to be crushed by the robotic revolution: Nurses, postal workers, retail staff, journalists and artists. But will robots ever really be able to convince us they’re just like people, able to care for the sick or write a good story? Several researchers have developed eerily lifelike robots that are supposed to look and behave just like people, but something is just off. That’s the uncanny valley, and Peters thinks it’s a very real phenomenon that could safeguard jobs like TV anchor or physician’s assistant. Humans will want to see humans in those roles, and robots just aren’t there yet. But roboticists like Tomotaka Takahashi are trying to get around the uncanny valley problem. Takahashi makes his robots cute, approachable, and modeled after Astroboy. It’s a great way of getting people to actually engage with machines socially and emotionally. Rethink Robots’ Baxter is also delightfully cartoony. While robots that look like robots just might disarm us, robots that look too human might not succeed in the workforce because, uh, they’re unnerving. With the revolution around 1980 of P.C.’s, the spreadsheet programs were tuned for office workers, not to replace office workers, but it respected office workers as being capable of being programmers. So office workers became programmers of spreadsheets. It increased their capabilities. They no longer had to do the mundane computations, but they could do something much more. Yet companies and governments are looking to pump more mechanized employees into the economy, like it or not. Jobs that involve repetitive or dangerous tasks and can be done faster and more efficiently with robots are the first on the chopping block. As machines’ motor skills and artificial intelligence advance, more may follow that unsettling route. For now, I’m looking at the robo workforce with cautious optimism. Because while I wouldn’t want Bender stealing my job, I’d for sure go to afterwork happy hour with him.